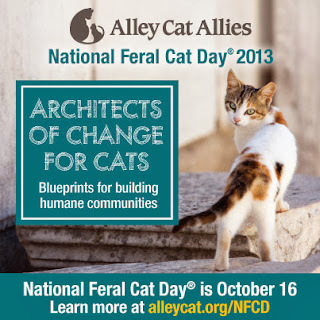 Tomorrow, October 16th, is National Feral Cat Day. Alley Cat Allies launched the event back in 2001 to raise awareness about feral cats, promote Trap-Neuter-Return, and to recognize the millions of compassionate Americans who care for them. More and more people are celebrating National Feral Cat Day each year. In 2012, 450 events were held nationally, with some held internationally. The year before that, in 2011, there were 351 events, which was almost twice as many as in 2010. We can’t wait to see how many people National Feral Cat Day reaches this year! Today I want to take a moment to debunk some common myths about our feral friends. Myth: Stray and feral cats are the same. Truth: Feral cats have not been socialized to people, and therefore are unadoptable. Feral kittens can often be adopted into homes, but there is a crucial window of time during which they must be socialized or they will remain feral. Myth: Feral cats are a disease risk for humans. Truth: Most diseases that infect cats can only be spread from cat to cat, not from cat to human. You are much more likely to catch an infectious disease from a person standing in line with you at the grocery store than from a cat. Myth: Feral and free-roaming cats are suffering. Truth: They find shelter, food, avoid people, fight off predators and are more likely to die from natural causes than by euthanasia at a veterinarian. How is that any different from the other wild animals in your backyard such as raccoons or squirrels? They are not suffering, they are living a natural lifestyle. Why kill an animal living a natural lifestyle simply because it isn’t living with people? Myth: They cause wildlife depletion. Truth: Humans are the cause of wildlife depletion, thanks to habitat loss, urbanization, pollution, and environmental degradation. Myth: Feral cats should be taken to the shelter. Truth: More than 70% of all cats who enter shelters die there, including virtually 100% of feral cats. Myth: Feral cats are unhealthy and have shorter life spans. Truth: Feral cats live full, healthy lives outdoors—there is no reason for them to be killed in shelters. Cats have lived outdoors for more than 10,000 years. The nation's animal shelter system is the #1 cause of death for cats. Myth: Trapping and removing will solve the problem. Truth: Cats reside in a certain location for 2 reasons: there is a food source and shelter. Once cats are removed new ones will move into the area and begin breeding. The only trapping that works is a local community's Trap-Neuter-Release (TNR) program where neutered and vaccinated cats are returned to their outdoor home. The colony's population stabilizies...no more kittens! Honestly, it breaks my heart to know that millions of cats out there will live their entire lives never knowing the love and protection that our housecats enjoy, but unfortunately this is the hand that they've been dealt because so many people have allowed their domesticated cats to fend for themselves, producing offspring that are never introduced to people. Humans have caused this problem, so it's our obligation to do the best we can to protect these innocent creatures. GREAT post! There are so many myths and fallacies about ferals. Thank you for helping get the truth out there! Thanks so much for your post. I wish more people would set up cold weather shelters. Thanks for spreading the word. This is excellent information. I wish everyone would understand that feral cats can live happy, safe, and fairly long lives in managed colonies.